Italian musical composer, born at Tarento in the Kingdom of Naples on the 9th of May 1741. The beauty of his voice attracted so much attention that in 1754 he was removed from the Jesuit college at Tarento to the Conservatorio di S. Onofrio at Naples, where he studied under Francesco Durante, and in process of time rose to the position of assistant master. For the theater of the Conservatorio, which he left in 1763, he wrote some intermezzi, one of which attracted so much notice that he was invited to write two operas, La Pupilla and Il Mondo al Rovescio, for Bologna, and a third, Il Marchese di Tulipano, for Rome. His reputation being now firmly established, he settled for some years at Naples, where, notwithstanding the popularity of Piccini, Cimarosa and Gugliehni, of whose triumphs he was bitterly jealous, he produced a series of highly successful operas, one of which, L'Idolo cinese, made a deep impression upon the Neapolitan public. In 1772 he began to write church music, and composed a requiem for Gennara Borbone. In the same year he married Cecilia Pallini, with whom he lived in continued happiness. 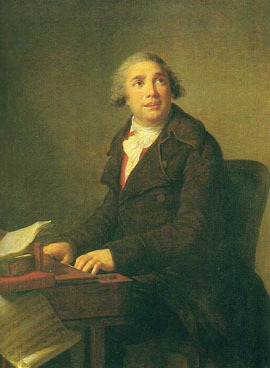 In 1776 Paisiello was invited by the empress Catherine the Great to St. Petersburg, where he remained for eight years, producing, among other charming works, his masterpiece, Il Barbiere di Siviglia, which soon attained a European reputation. The fate of this delightful opera marks an epoch in the history of Italian art; for with it the gentle suavity cultivated by the masters of the 18th century died out to make room for the dazzling brilliancy of a later period. When, in 1816, Rossini set the same libretto to music, under the title of Almaviva, it was hissed from the stage; but it made its way, nevertheless, and under its changed title, Il Barbiere, is now acknowledged as Rossini's greatest work, while Paisiello's opera is consigned to oblivion -- a strange instance of poetical vengeance, since Paisiello himself had many years previously endeavored to eclipse the fame of Pergolesi by resetting the libretto of his famous intermezzo, La Serva padrona. Paisiello left Russia in 1784, and, after producing Il Re Teodoro at Vienna, entered the service of Ferdinand IV at Naples, where he composed many of his best operas, including Nina and La Molinara. After many vicissitudes, resulting from political and dynastic changes, he was invited to Paris (1802) by Napoleon, whose favor he had won five years previously by a march composed for the funeral of General Lazare Hoche. Napoleon treated him munificently, while cruelly neglecting two far greater composers, Cherubini and Méhul, to whom the new favorite transferred the hatred he had formerly borne to Cimarosa, Guglielmi and Piccini. Paisiello conducted the music of the court in the Tuileries with a stipend of 10,000 francs and 4800 for lodging, but he entirely failed to conciliate the Parisian public, who received his opera Proserpine so coldly that, in 1803, he requested and with some difficulty obtained permission to return to Italy, upon the plea of his wife's ill health. On his arrival at Naples Paisiello was reinstated in his former appointments by Joseph Bonaparte and Murat, but he had taxed his genius beyond its strength, and was unable to meet the demands now made upon it for new ideas. His prospects, too, were precarious. The power of the Bonaparte family was tottering to its fall; and Paisiello's fortunes fell with it. The death of his wife in 1815 tried him severely. His health failed rapidly, and constitutional jealousy of the popularity of others was a source of worry and vexation. He died on the 5th of June 1816. Paisiello's operas (of which he is known to have composed 94) abound with melodies, the graceful beauty of which is still warmly appreciated. Perhaps the best known of these airs is the famous "Nel cor più" from La Molinara, immortalized by Beethoven's delightful variations. His church music was very voluminous, comprising eight masses, besides many smaller works; he also produced fifty-one instrumental compositions and many detached pieces. Manuscript scores of many of his operas were presented to the library of the British Museum by Dragonetti. The library of the Gerolamini at Naples possesses an interesting manuscript compilation recording Paisiello's opinions on contemporary composers, and exhibiting him as a somewhat severe critic, especially of the work of Pergolesi.